Harry Christopher "Chip" Caray III (born February 27, 1965) is a television broadcaster for Fox Sports South and Fox Sports Southeast's coverage of the Atlanta Braves baseball and Southeastern Conference basketball, and is an occasional radio broadcaster and co-host of the pre-game and post-game shows on the Atlanta Braves Radio Network. Chip is also known from his time as a broadcaster for the Fox Saturday Game of the Week and as the television play-by-play broadcaster for the Chicago Cubs from 1998 to 2004. He is the son of broadcaster Skip Caray, the grandson of broadcaster Harry Caray and the older half-brother of broadcaster Josh Caray. 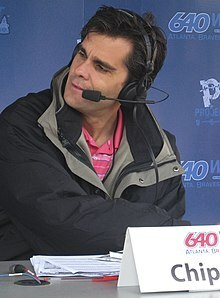 Chip Caray's grandfather, Harry, was a broadcaster famous for calling games of the St. Louis Cardinals, Oakland Athletics, Chicago White Sox and Chicago Cubs. His father, Skip, was the longtime broadcaster for the Atlanta Braves until he died in 2008. Chip Caray occasionally imitates his father with sarcastic comments made in a high, nasal voice. Caray also has a brother, Josh, who is the radio broadcaster for the Hudson Valley Renegades (the Class A Short Season New York–Penn League affiliate of the Tampa Bay Rays). ^ Hayens, Stephen (June 16, 2016). "Renegades radio man Josh Caray is of baseball broadcast royalty". Poughkeepsie Journal. Retrieved December 2, 2017. This page was last edited on 18 July 2018, at 13:15 (UTC).